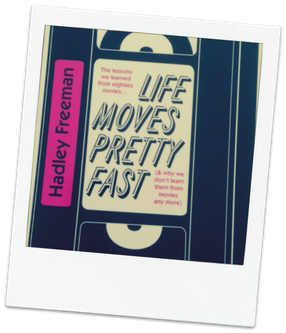 A couple of months ago, I read a brilliant book called Life Moves Pretty Fast by Hadley Freeman. In this book, Freeman examines the lessons we learned from 80s movies and discusses why we don’t learn them from movies anymore. I was genuinely sad to finish Freeman’s book. However, the good news is that I now have an excuse to revisit some of my favourite 80s movies! Meanwhile, in this post, I list my top 20 favourite 80s films. I watched Desperately Seeking Susan many, many times growing up. Watching this film again, I am aware of its bizarrely complicated plot involving stolen Egyptian earrings, memory loss and mistaken identity (plus a surreal magic show act). However, I still love this movie because it is chock full of superb actors. Rossana Arquette and Madonna give brilliant performances and who can resist that soundtrack (not me). I adore St Elmo's Fire. Joel Schumacher's wonderful coming of age movie introduced the world to a group of young actors - soon to be known as 'The Brat Pack'. Having recently watched Poltergeist again, I realised that I had forgotten just how good this film is - even after 34 years. This is no surprise when you consider its pedigree. Steven Spielberg wrote the script it was directed by Tobe Hooper (Texas Chainsaw Massacre). Featuring (then) state of the art special effects, Poltergeist works because Spielberg focuses on and makes you care about the family involved. Don't bother with last year's remake... go for the original and the best. Oh my goodness... the shoulder pads, the eye shadow... the fight against sexism in the workplace. Working Girl is brilliant, brilliant, brilliant. I remember watching Mike Nichols' film when I was younger and feeling inspired. It made me feel that I, like Melanie Griffith's Tess McGill, could do anything I put my mind to - and if I get to date Harrison Ford in the process, well so be it. The Empire Strikes Back is my favourite of the first three Star Wars movies. My parents took me to see this film at The Empire, Leicester Square in London. This experience has become one of my fondest early cinema memories. Who doesn't love a bit of Dirty Dancing? I remember watching it at a sleepover with friends and we were all hooked by the story (and Patrick Swayze of course). Remarkably, this was a film that nobody wanted to support. Big mistake... huge. Behind the dancing and the romance, this film has become what Freeman calls "one of the greatest feminist films of all time". For a start, Dirty Dancing is told entirely through Baby's (Jennifer Grey) female gaze - something that happens all too rarely today. In addition, the film's writer, Eleanor Bergstein, carefully plotted in an important social message - the dangers of illegal abortions. Dirty Dancing - so much more than just a girl carrying a watermelon. A film with such a simple story to tell, Pretty In Pink is one of my favourite John Hughes films. I love this movie because of its brilliant cast. Molly Ringwald, John Cryer, Andrew McCarthy, Harry Dean Stanton, Annie Potts and (the scene stealing) James Spader are all superb. In addition, Andie is such a strong female role model. She is an individual who is brave and unafraid to stand up for herself. However, I still think Andie should have left Iona's prom dress well alone. It looked much better before she attacked it with shears and attached her net curtains. Growing up, I became addicted to Stephen King's books. I just couldn't put them down. The Shining was one of my favourites. Now, of course, films are rarely as good as the books on which they are based. Stanley Kubrick's The Shining is an exception. This is a fantastic, deeply unsettling film with a iconic performance by Jack Nicholson. While I have seen The Shining countless times, I am nowhere near the level of devotion/obsession featured in documentary Room 237, which really has to be seen to be believed. I watch Steel Magnolias on a regular basis. The film's whip smart script delivered by a truly superb cast never fails to make me laugh. More than anything else, I love the powerful depiction of female friendship in this movie. Of course, as the film progresses, it becomes a tougher watch (note: always have a box of tissues to hand). But if you can make it through Sally Field's church yard speech you are on the home straight and I guarantee you'll be back for more. Blade Runner is a timeless, science fiction classic. It is hard to imagine, then, that Ridley Scott's film flopped on its release in cinemas. The reason? The studios had insisted on adding a (ridiculous) happy ending. Once Scott released his director's cut, Blade Runner began to find its audience and, thanks to the film's powerful story, stunning cinematography and wonderful score, has grown in stature ever since. One of my favourite horror films of all time, John Carpenter's The Thing is pure adrenaline-fueled paranoia from start to finish. Really, this film is a masterclass of suspense and tension. The Thing's special effects remain something wonderful (if icky) to behold and Ennio Morricone's score is just fantastic. (Of course, special mention has to go to Kurt Russell's beard, which is fabulous). I love Die Hard not only because it is just ridiculous amounts of fun but also because it is one of my favourite Christmas movies. Nothing gets me in the yippee ki yay festive mood better than Bruce Willis in a vest, explosions and machine guns I guess. In addition, who can resist Alan Rickman's superb performance as Hans Gruber? Genius. Broadcast News is just superb. James L Brooks' film has a superb cast, a superb story and a superb script. Like with Working Girl, I remember watching this film when I was young and feeling inspired by Holly Hunter's Jane. She is strong, determined and brilliant at her job. What a fabulous role model for any young girl hoping to make a career in the media or, indeed, anywhere. It's a shame that we don't get to see more of these powerful female characters. Yes, it does feel odd putting Ghostbusters ahead of films such as Blade Runner, The Shining and Broadcast News. However, in my defense, when I think of 80s movies I think of Ghostbusters. I loved Ghostbusters then and I love it now - this film is a blast - every time. Who doesn't love Ferris Bueller's Day Off? If you don't, you may want to check for a pulse. How can you resist Ferris and Cameron? This film has the most amazing energy and a powerful message: life moves pretty fast, if you don't stop and look around once in a while you could miss it. I'm with you there, Ferris. I can't count the number of times I have watched Back To The Future. However, I do remember the first time. Coming out of the cinema, I knew I had seen something special (and I knew that I was going to marry Michael J Fox). Well I was right on one count at least! This film is a wonderful, timeless classic in more ways than one. I was terrified of ET when I first saw this movie. There was something about him that just unsettled the young me (probably the fact that you can see his heart through his skin - eugh). However, I soon grew to love Stephen Spielberg's little alien and the family he ends up spending time with. I just wish I didn't cry so much while watching it... even the trailer gets me teary. Darn you, John Williams. Pretty much the perfect family action film, Spielberg's Raiders Of The Lost Ark is one of my favourite films of all time regardless of the decade. Even while watching, it feels hard to believe that so many iconic scenes take place in one movie. I was lucky to see Raiders Of The Lost Ark accompanied by a live orchestra at the Royal Albert Hall recently. This was an amazing cinema experience - and one that I would wholeheartedly recommend. I love The Princess Bride. My entire family loves The Princess Bride. It is so much more than just a 'kissing' story. This is a timeless classic that is just full of superb, memorable comedic performances from the likes of Billy Crystal, Carol Kane and Peter Cook. Every scene is just brilliant. Click here for ten more reasons why I think that The Princess Bride is a perfect family movie. When Harry Met Sally is another of my very favourite films. I just love Nora Ephron's movie. It is so smart, makes me laugh, makes me cry and I have to watch it on a regular basis or all is not right with the world. Hence (after much internal debate and struggle) it is number one on my top 20 favourite 80s movies list! Click here for ten key life reasons we can learn from watching When Harry Met Sally. What do you think of this list of 80s movies? Is your favourite on there? If not, do let me know what I've missed. Feel free to leave me a comment in the section below! That book sounds amazing. I'll have to get my hands on it. Nice list! Some classics on here. Sadly, I still need to see The Princess Bride. That's pretty bad for a guy who grew up in the 80s. My only real gripe is Blade Runner being here. I hate that movie and it wouldn't be anywhere near my list. Of course, I'm probably the only person who feels that way, but whatever. I could go on, but I'll stop there. Great job! Yes, our list would differ a bit but I think that's mainly because of our difference in gender. Pretty in Pink, Steel Magnolias and Dirty Dancing are all nice to watch and remenisce about the 80's, but none are even close to my top 20. I also agree with Wendell that Blad Runner isn't all it's cracked up to be. My #1 would probably be Die Hard because I just absolutely love that movie, but the big question remains as to how we look at 80's movies; from our teenage selves or from our mature ones. I was born in '74, so my 80's experience was from age 6-16 and as my name says I saw lots and lots of movies back then, but my 80's self differs from my now self as to what is good and what is bad. For instance, My 80's self loved The Beastmaster (1982), but when I rewatched it a few years back, I absolutely HATED it. My 80's self would rate Dirty Dancing higher than I would now for similar reasons. As a male, many of the movies from the 80's that influenced me were geared towards boys/men like The Goonies, Top Gun and Stand By Me. I liked Working Girl and Broadcast News, but neither would make my top twenty either. When Harry Met Sally, Die Hard, Empire Strikes Back, Back to the Future and Raiders all probably would make my top 5, but I love so many movies from the 80's (It's my all time favorite movie decade because it really shaped my likes and dislikes of movies) that it would be quite hard to decide on an order. Dead Poet's Society, Planes Trains and Automobiles, Platoon, The Breakfast Club. The Goonies, The Princess Bride, E.T., Temple of Doom, Return of the Jedi, Cinema Paradisio, Fast Time at Ridgemont High, Ferris Bueller, Escape from Sobibor, Indiana Jones and The Last Crusade and Parenthood probably would round off my top 20 in some order. Still haven't found a way to read that book even though I really want to read it. Thanks for giving such a great topic to discuss and mull over! Thank you for your comments Wendell and Rob! Wendell - you must watch The Princess Bride!!! It is such a classic - I hope that you enjoy it as much as I do. Reading your list and Rob's suggestions, I want to re-do my top 20 - or at least make it longer! I need to watch Do The Right Thing again. It's been too long. I love A Nightmare On Elm Street too. I agree Rob, my movie self differs from when I was a kid in that decade to today. Both Top Gun and The Goonies nearly made my top 20 but I am kicking myself for not thinking of the wonderful Stand By Me. What I love about your comments is that it gives me even more of an excuse to revisit these classic 80s movies. Thank you so much! I need to catch up with some of these films! So pleased to see you put When Harry Met Sally at number one, that is one of my all time favourite films as well a film that I love each more every time I watch it!